Collectors of horse models love each and every single one they have, whether for a different paint color, a different harness, large draft horse pulling a cart or a small pony, the magnificent red chestnut stallion or the beautifully crafted horse with exquisite details gracefully galloping across the meadow. If you’re wondering what are the great Christmas gifts for outdoor lovers, try giving horse Christmas ornaments or stunning model horses. Intricately detailed magnificent horse collectible gifts make lovely home decor items too. You’re buying holiday gifts for horse lovers? Then check out the stunning horse collectibles below. Rich, lovely colors, attention to details from the mane to the tail, magnificent red chestnut stallion that is meticulously hand painted, beautiful life-like pose. After getting one of these beauties, you’ll feel like starting a collection of gorgeous horse statues or model horses. The beautiful details will take your breath away. Dress up your beautiful horse with a saddle and bridle and you’ll have difficulty taking your eyes away from this awesome beauty. 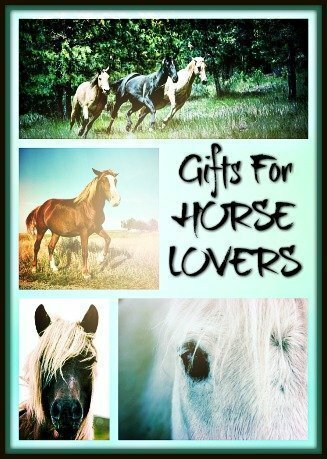 Of course, besides the beautiful horse sculptures as gifts, there are other useful and thoughtful gifts for horse lovers too. 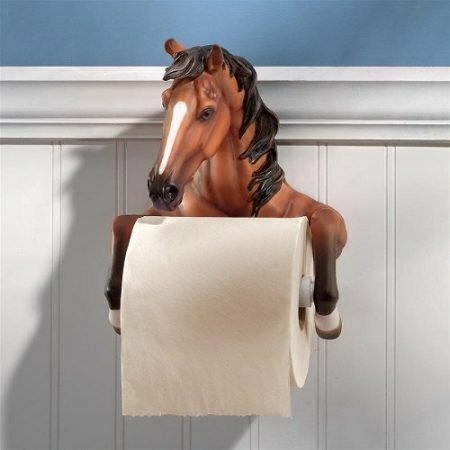 For example, horse themed coffee mugs or kitchen gadgets and horse inspired home decorative items make wonderful housewarming or birthday gifts too. Impressive, graceful, strong, beautiful – horse statues are gifts that any horse lover will treasure. 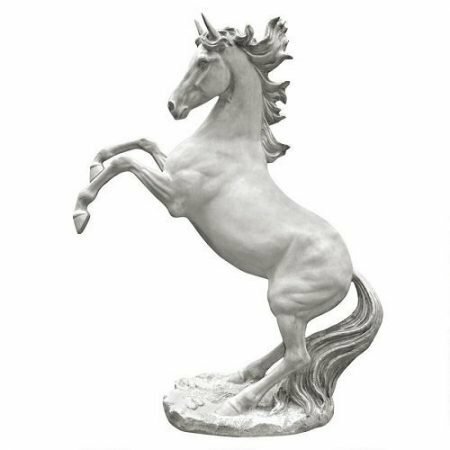 This beautiful galloping horse statue is hand-crafted one-piece-at-a-time in the traditional lost wax method. Tail in the air, mane flying, what an amazing graceful beauty! 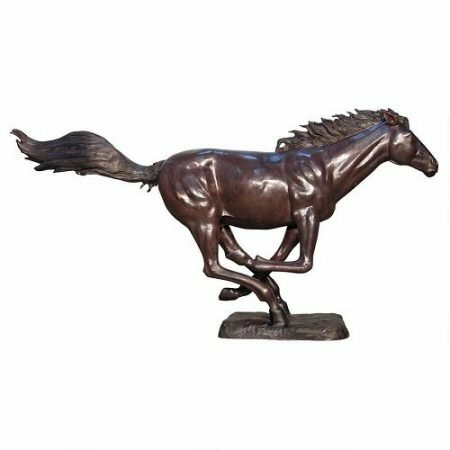 The impressive Racing the Wind running horse cast bronze sculpture is over 7.5′ long and over 4′ tall. Such power and majestic strength from a rearing bay stallion! 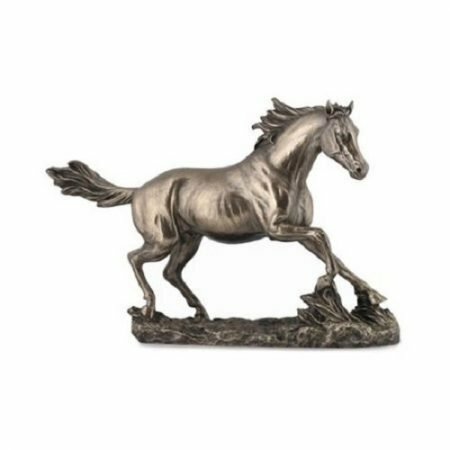 This exquisite beautiful wild stallion statue is cast in quality designer resin, reinforced with fiberglass for strength and comes with a faux stone finish. 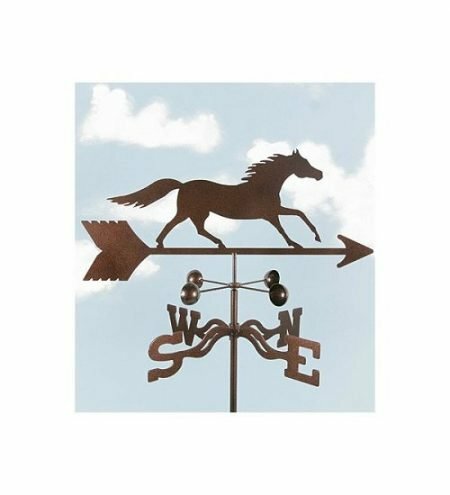 This running horse weather vane 60″ garden stake can be mounted on your deck too. It is crafted from precision-cut, 14-gauge steel; zinc plated with copper-tone and clear powder coat finishes. 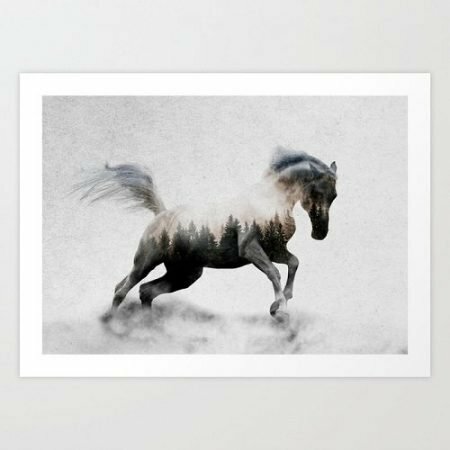 The stepping stone of the beautiful image of a wild mare and her foal running side by side is sure to please any horse lover who loves gardening. 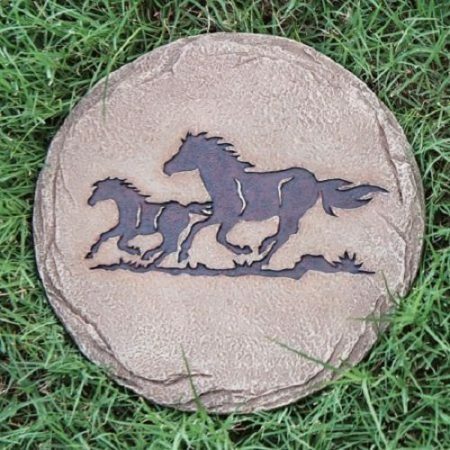 What a great way to bring horses into your garden with these running horses stepping stones. Such a lovely meditating horse statue in a calm and peaceful pose, radiating tranquility to the surroundings. 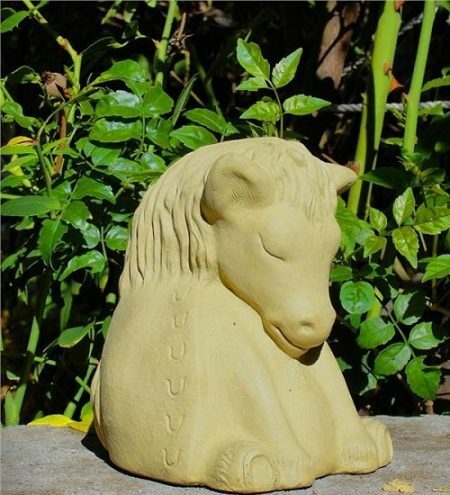 Measuring 6″ H x 5″ W, the horse is hand crafted in America from solid cast-stone (concrete) made with integrated coloring. It is sealed for outdoor use. 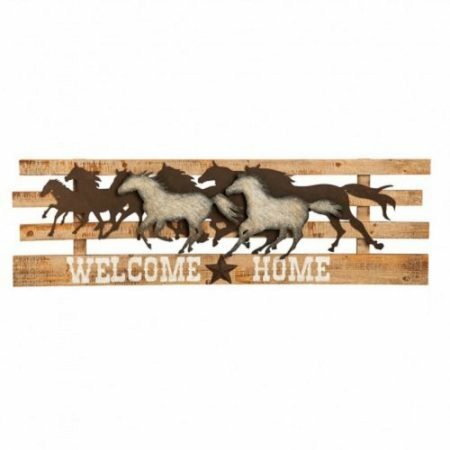 This easy-to-hang galloping horses equine themed wall sign to welcome guests measures 18.20” x 3.50” x 54.20. Charming and full of rustic chic appeal, die-cut metal horse silhouettes are galloping across the wooden background. The welcome home message is hand painted. It comes with 2 hooks at the back for easy hanging. 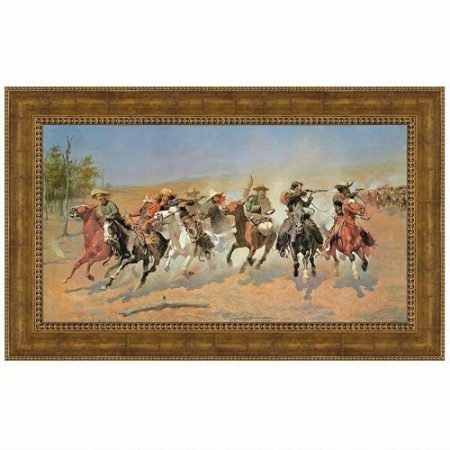 A fan of cowboys, horses and the American wild wild west would love this horse themed stretched canvas replica painting. This spectacular galloping horse painting replica with imported hardwood frame highlighted in antique gold tones come in 4 sizes: small, medium, large and grand. 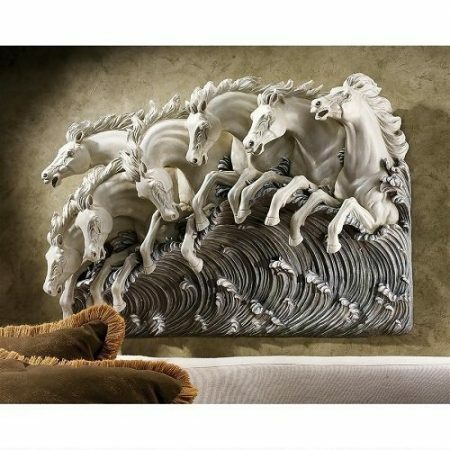 This equine wall sculpture is cast in quality designer resin and hand painted in a naturalistic palette. Hand-finished in quality designer resin to replicate a true antique, this Neptune’s horses of the sea wall frieze measures 31½”Wx7″Dx22″H. It weighs about 20 lbs. 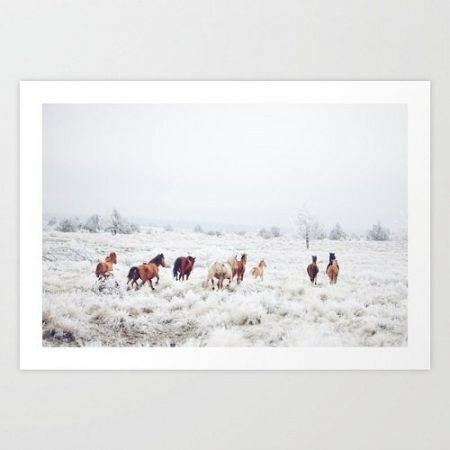 Printed and stretched onto sturdy canvas, this meeting horse canvas art comes with back keyhole for easy hanging. The canvas measures 30 x 30 x 1.5 inches. 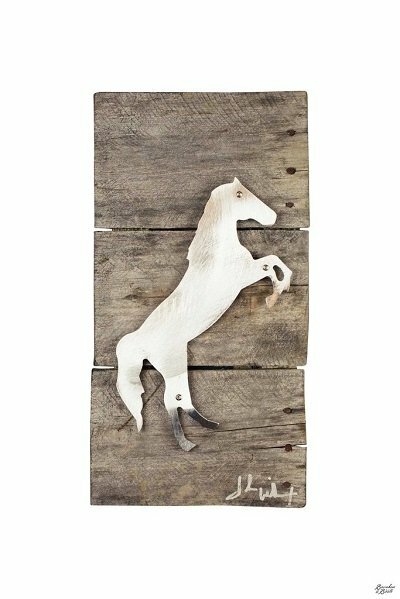 Measuring 16″ x 19″, this reclaimed wood raring horse stallion artwork comes with hanging hardware and authenticity sticker. Materials used are pieces of reclaimed barn wood and metal. 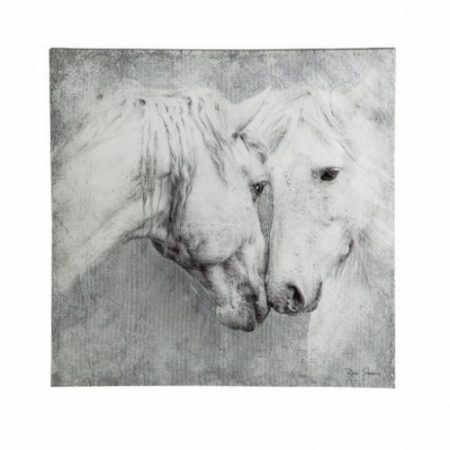 There are plenty of home decor items that you can give as gifts for horse lovers. 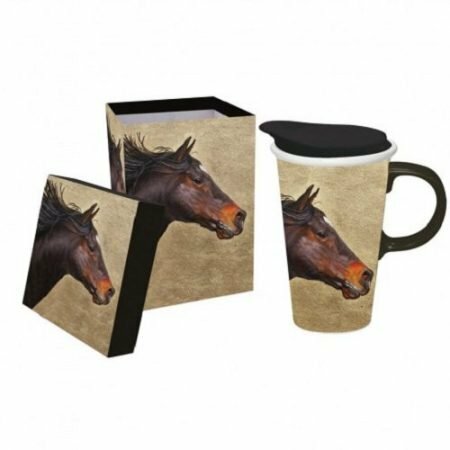 This 17 oz horses on the run ceramic mug comes with a three-ring silicone lid that fits perfectly into the cup’s molded grooves thus ensuring no leaks. It is top rack dishwasher safe. You can also reheat your mug of coffee in the microwave. You’ll receive it in a beautiful gift box with the same image. This would indeed make a lovely gift for the passionate horse lover who loves coffee. 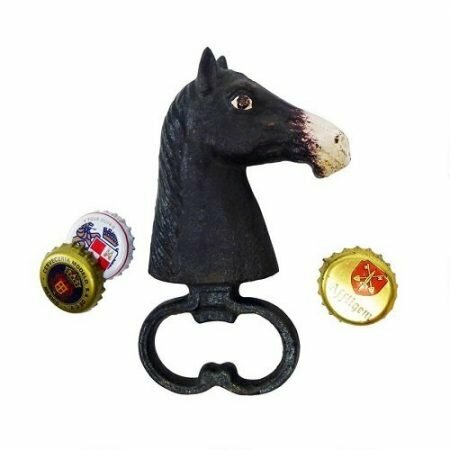 Handcrafted using the time-honored sand cast method, this vintage inspired horse head bottle opener is hand-painted in vintage muted hues reflecting a classic equestrian style. It measures 3½”W x 1″D x 5½”H and weighs about 1 pound. What a fun and cool way to remove the cap of the bottle. It looks great as a decorative item too. 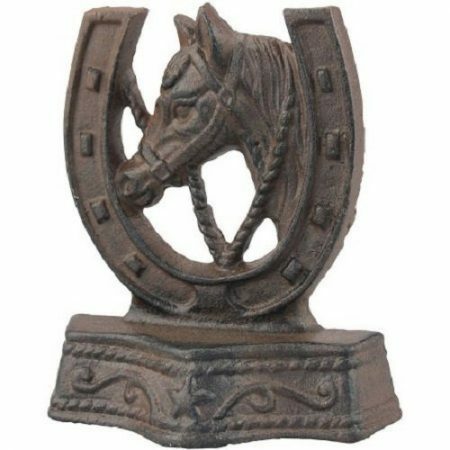 With a vintage inspired weathered rust finish, this Horse and Horseshoe Door Stopper can double as a paperweight, a single bookend or just as adorable equestrian decor. It measures 4.7″W x 5.5″D x 2.4″H. This is indeed a fun and functional gift for horse lovers who are into retro stuff. Hand-crafted in heavyweight foundry cast iron, these cast iron horse bust bookends are then hand painted to get a distressed antique look. Decorative and functional, what a great way to display your books. Each horse bust measures 6½” W x 5½” D x 9½” H.
Perhaps you prefer a galloping horse bookend instead? 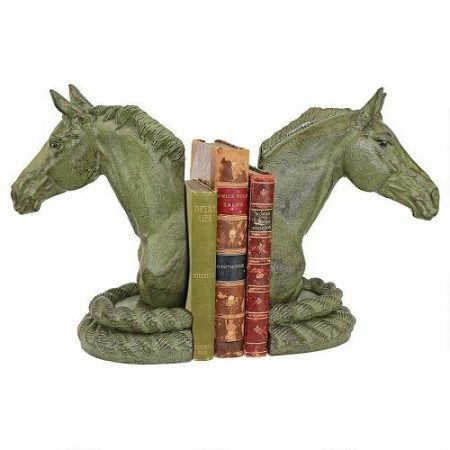 These galloping horses bookends are replicated in heavyweight cast iron directly from the antique original and set atop a solid marble base. 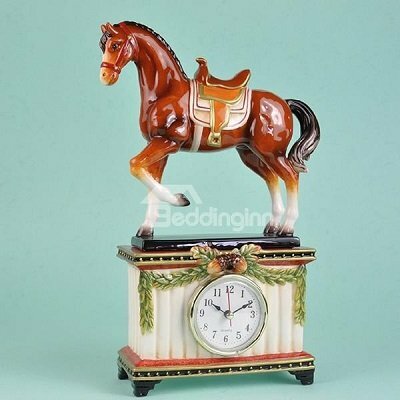 Made of ceramic and hand painted, thislovely decorative horse desktop clock measures about 6″ x 2.7″ x 11.3″. Made of cold cast bronze, this cantering horse figurine measures 13.6″ L x 3.5″ W x 8.7″ H.
This Breyer Phoenix horse figurine is modeled on a real equine record holder. 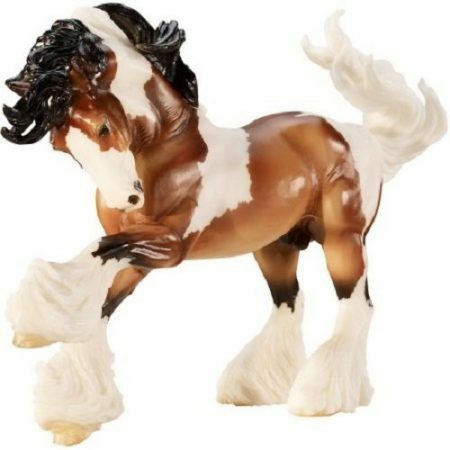 Crafted and hand painted with realistic details, this gorgeous traditional series model is part of Breyer’s breeds of the world collection. 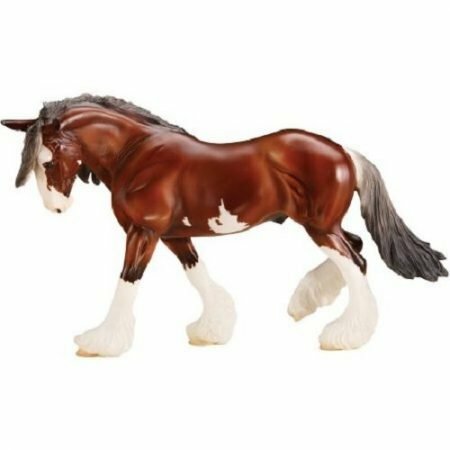 This beautiful Clydesdale horse is modeled approximately in the scale of 1:9. This is another traditional horse series made at a scale of 1:9. The Gypsy Vanner horse originated in the United Kingdom and first imported to USA in 1996. They used to serve as transportation horses. This horse and rider weather vane sculpture would make a beautiful display decorative item on a mantel, bookshelf or coffee table. 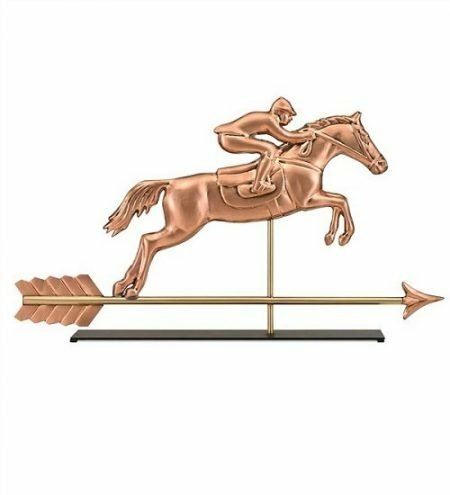 Nearly 3′ long, this copper crafted rider and horse in mid leap comes with a brass and copper arrow. The sculpture has a black metal display base. The sculpture measures 33″L x 2″W x 18½”H and the base is 24″L x 4″W. 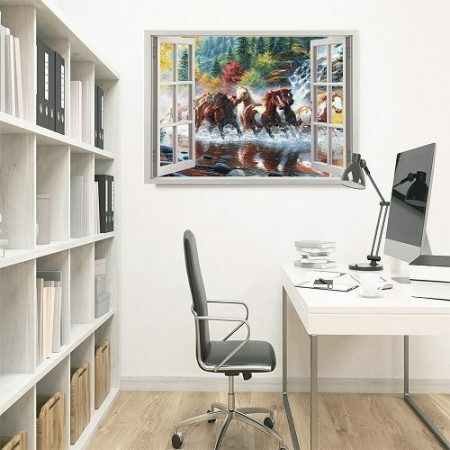 This realistic looking galloping horse wall sticker is made of pvc. It can be used on any smooth, dry, flat and clean surface. The sticker measures 35.5″ x 16″. This horse themed pvc wall sticker is available in various sizes. 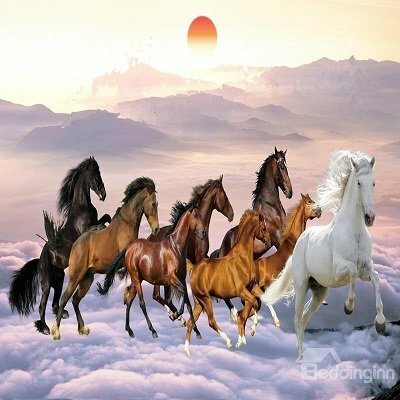 Wow, the horses look as if they’re galloping towards you! 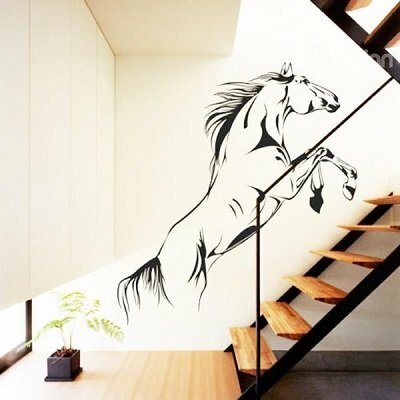 Your horse lover friend would certainly love this horse themed 3D wall sticker. 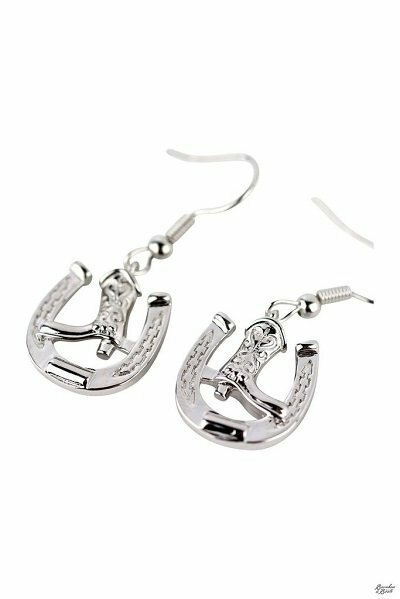 A pair of silver cowboy boot and horseshoe earrings for the cowgirl in your life. The cowboy boot is crafted in beautiful details and placed within a horseshoe in this lovely dangling style earrings. The earring measures 2″ x 2″. 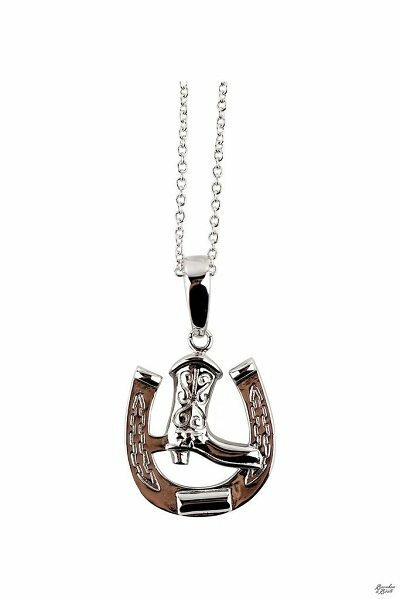 This cowboy boot and horseshoe necklace comes with an 18″ chain. Pair it up with the horseshoe earrings above for a complete horse themed jewelry gift to your horse lover friend and family members.